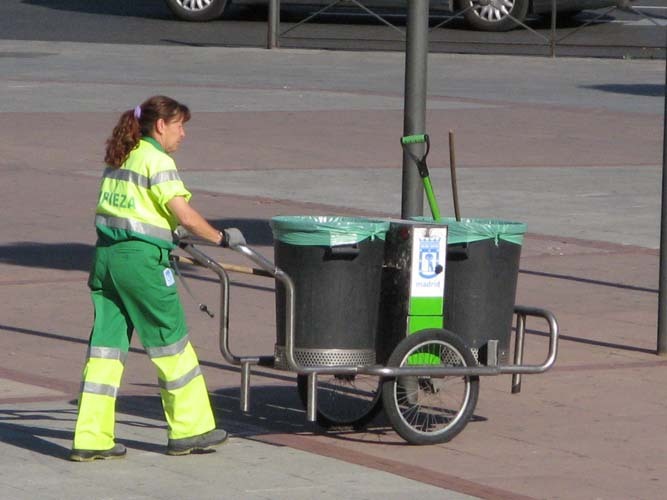 Unlike the French, whose historical reputation for not being too concerned by personal hygiene is well known, cleanliness is a very important concept for Spaniards. Could it come from the cultural influence of the Arabs, who occupied this land for many centuries? I can’t really say. Anyway, houses in Spain are generally spotless. So are the hotels and restaurants visited by numerous holidaymakers who know they’ll get high quality service, including cleanliness, for a very good price. As a matter of fact, cleaning ladies carry on cleaning all day long. Not only do they scrub, polish and disinfect at home but also at the office; and it’s sometimes disconcerting to find your couch or your desk out of reach because someone armed with a damp cloth is occupying it. Indeed, some Spanish ladies dedicate such energy, thoroughness and resolution to cleaning that it borders on an obsession. However, I’m surprised to see that outside, in some streets and public places, this concept doesn’t seem to come into effect. Garbage covers the ground, trashcans overflow and many people, regardless of their surroundings, are used to spitting on the floor… It must be said that Spaniards aren’t famous for their social consideration. The way of doing things here is ‘every man for himself’, and the others should mind their own business. Maybe that’s why, in public places, everybody behaves as if someone else is responsible for cleaning up after them. This phenomenon is best observed in some popular bars and cafés. Everyone knows what tapas are: little appetizers that are served with drinks. 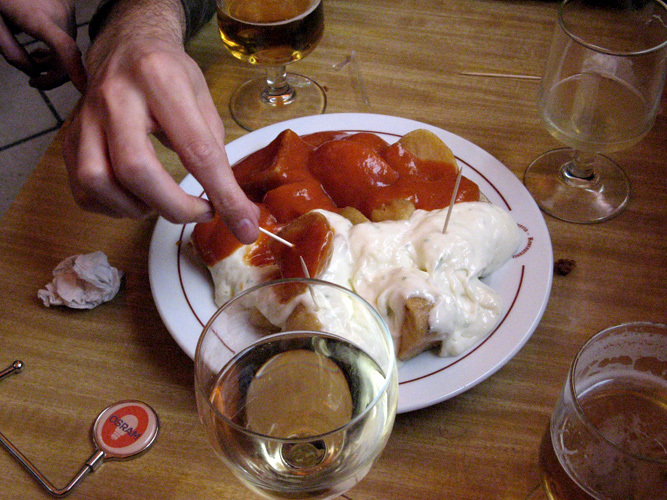 In most cities, the tradition is to serve a free tapa with each round of drinks. Paper napkins and toothpicks are also available. One disadvantage of this tradition is that, after consumption, olive pits, toothpicks and napkins eventually land on the floor. 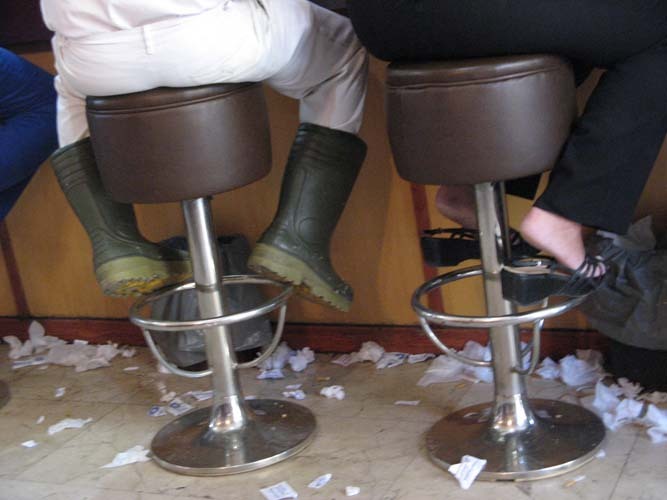 When you enter such café, you may have to push your way through the garbage to reach the counter; or wait for the cleaning lady to sweep the floor. Pepe el Guarro (Joe the Swine) is one of these places. 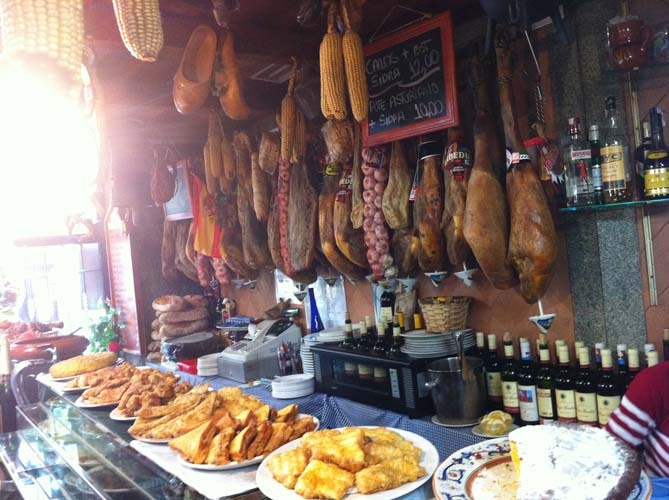 It made itself famous for offering the largest free tapas helpings. The house specialty is deep fried chicken wings. You’ll be served a plate full of them just by ordering a round of beers. 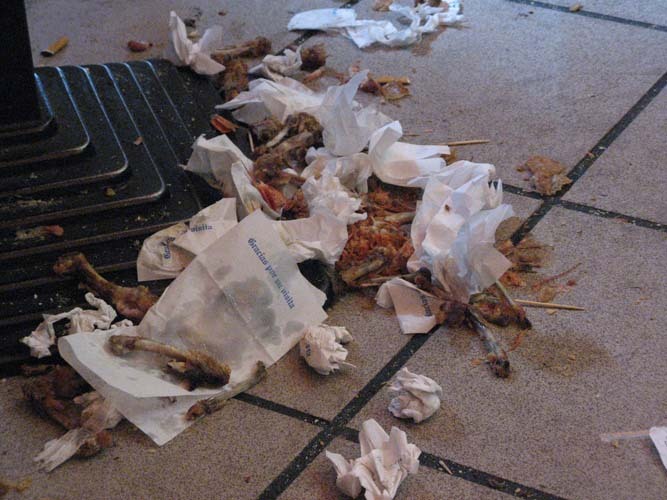 Whilst drinking, you can happily gnaw at your chicken wings, and spend a jolly time here, and drink some more beers, and eat some more tapas… But don’t be surprised when you go to the rest room, if you hear a strange sound at every step you make. This is no auditory hallucination caused by the beverage, just bones under your shoes.